We go on a detox like we go for a pedicure! Wherever I go, I hear someone tell me they’re doing a detox or I meet a holistic health practitioner who does detox with their clients. I get it! Because of the toxins in our foods, the junk we eat, the polluted air we breathe, chemicals in our skin care and cleaning products, detoxing seems like a really good idea! Reason # 1: Where do the toxins go? Many people when they’re on a detox of some kind, experience “detox symptoms”. They have skin issues, excess mucus, coughing, headaches, excessive fatigue, and the list goes on. Well, these are good, right? It means that the cleanse is working. Yes, the cleanse is working. But when the body releases toxins where do they go? How do we eliminate them properly? Elimination is a key word here. The colon is one of our main elimination organs. When we poop we don’t just get rid of food stuff, we also get rid of cellular waste and toxins. In Ayurveda, during a detox process called Pancha Karma, we implement a series of practices done before the “cleanse” which bring the waste build-up back into the digestive system. Then during the “cleansing” period, other strategies like enemas help metabolize and eliminate these toxins. So are you supporting your body to eliminate the toxins that are being brought up to the surface? Reason # 2: What happens after the cleanse? So let’s be honest here! The main reason why we detox it’s because like dieting, it’s a quick fix that gives us instant gratification. Meaning, we may feel good and even look good, we lose a few extra pounds, we have more energy! But what happens after the cleanse? We go back to our food habits and choices. Nothing has changed really. The results are momentary. At some point we’ll have to do it all over again. In this sense we could speak of yoyo-detoxing! And just like yoyo-dieting, yoyo-detoxing can wreak havoc in our bodies. Contrary to popular belief, short-term detox cleanses ruin our digestive ability. I speak from experience. Back in the 80s and 90s when I was a model I was doing cleanses in order to fit in a size 4. I continued doing cleanses way after my modeling career ended. Fasting and cleanses give you a high. I was hooked on the high that I experienced when I fasted for 7 and sometimes 10 days. One time, when I was living in Astoria Queens, my roommate and I repainted her whole kitchen in the middle of the night because we had so much energy that we couldn’t sleep! I was also brainwashed to fit a mold that my body could never fit in sustainably. (Do you know how hard it still is to find clothes that fit my slender chest and wider hips!!!!) Years later, when I transitioned into menopause I paid the price for my youthful foolishness. I had debilitating digestive issues. Our bodies are infinitely intelligent. According to Ayurveda, one of the reasons why we have symptoms is because we move away from our bodies’ innate intelligence. So instead of putting our bodies through the grueling experience that is a detox cleanse, why not support its natural ability to detox. Regular garshana massages (dry brushing) supports the lymphatic system to get rid of cellular waste. Eating lighter and earlier at night supports our liver to effectively metabolize waste and toxins. And eating whole, organic, seasonal and mostly plant foods which are high in fiber as well as vitamins and minerals supports proper elimination. In the end we all want good health, sound sleep and a peaceful mind. These are not obtained with quick fixes. 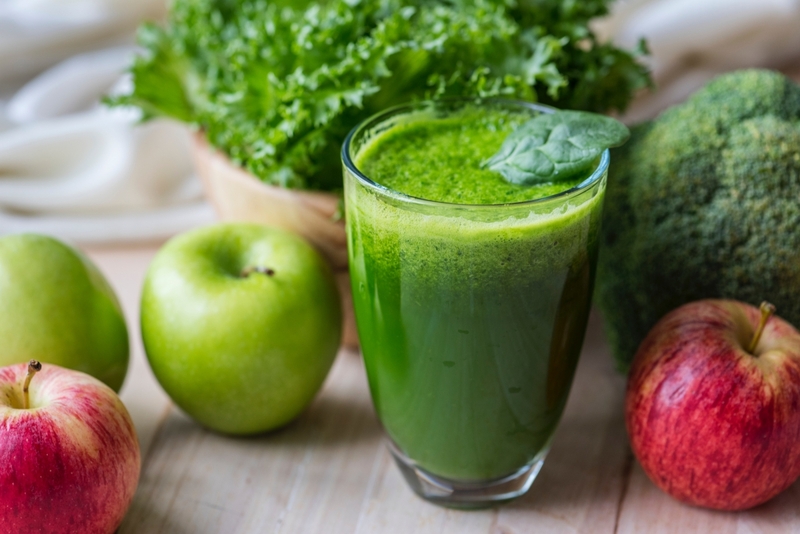 Click on the video below and get the skinny on green juices!